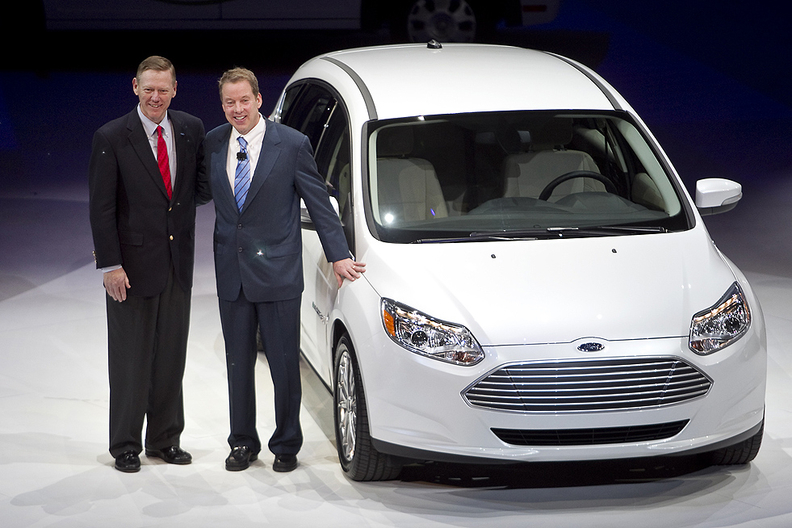 Ford CEO Alan Mulally, left. and Executive Chairman Bill Ford Jr., have been awarded nearly $99 million in Ford shares under an incentive program tied to the automaker's 2009 and 2010 performance. DETROIT (Bloomberg) -- Ford Motor Co. awarded CEO Alan Mulally $56.5 million in stock, and Executive Chairman Bill Ford received $42.4 million in shares as a reward for the automaker's turnaround. Ford paid the unrestricted stock to its top two executives as part of an incentive plan for 2009 and 2010, according to filings with the U.S. Securities and Exchange Commission. Ford earned $9.28 billion in the last two years after $30.1 billion in losses from 2006 through 2008. The executives will receive other compensation for 2010, including salary and benefits, which will be revealed in a proxy report in the coming weeks, said John Stoll, a company spokesman. Dearborn-based Ford withheld some of the stock awards to cover their income taxes. After taxes, Mulally received $33.4 million and Bill Ford got $25.1 million. "This is an indication of the performance that the company has experienced under Alan Mulally and Bill Ford's leadership," Stoll said Saturday in an interview. "Ford is committed to aligning executive compensation to the company's performance and long-term shareholder value." Mulally, 65, also received 884,433 stock options with a strike price of $14.76, which he can exercise until 2021, and he was awarded 543,734 restricted stock units that can be converted into shares in 2013. Bill Ford, 53, received 412,735 stock options with a strike price of $14.76, which he can exercise until 2021, and he was awarded 253,742 restricted stock units that can be converted into shares in 2013, according to the filings.